Through the brilliance that is Twitter, I stumbled upon a great company here in Toronto called Ecojot. I was immediately drawn to the energetic hand-lettering (duh) which prompted me to find out more. Ecojot is a stationary company run by Mark and Carolyn Gavin and they offer a variety of journals, note books, calendars, note cards and what caught my eye- sketchbooks. As you may have guessed from the name, Ecojot has quite the environmental conscience- all of their stationary is made with 100% post-consumer recycled paper, and everything is designed and printed in Canada (holla!). In addition they have also created the "GIVE" program: when a jumbo journal is purchased, a workbook is donated to a child in need- totally gives you the warm and fuzzies inside huh? I am in love with Carolyn Gavin's illustrations, her pattern work is so colourful and full of life, I can't help but drool (and feel extremely inspired!). 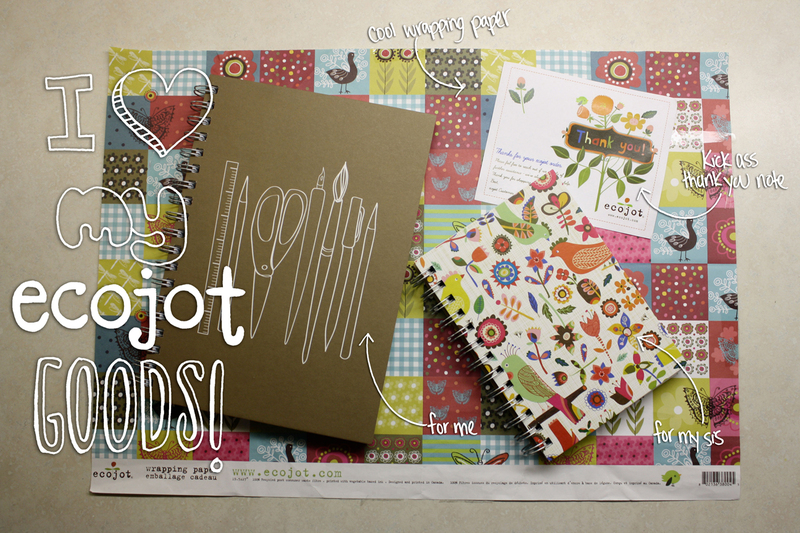 Please check out Ecojot and pick up a piece of stationary or two!